We need to put the best we have to offer within reach of our children. If we don’t do that we’re going to get the generation we deserve. I grew up in a television generation, the closest I could get to TV was knowing someone who was in the Wonderama audience once. I remember the first feeling of participation was in cryptographer class and the professor said here are some problems, and if you have any trouble here’s my home number. What did the Getty carve in stone? It was the hand prints of the people who helped build this place. In the garden: “Ever present never twice the same, ever changing, never less than whole.” Carved in stone at the Boston Public Library: “Free to All.” We have the opportunity to one-up the Greeks, they were able to build the Library of Alexandria. Universal Access to All Knowledge is within our grasp. Books. The largest print library is the Library of Congress, 26 million volumes. About 26 terabytes of data. That storage would cost about $60,000, so for the cost of a parking space in LA you could have the entire library of Congress spinning on Linux disks. There are different ways for reading books online: PDF, booklike formats. Brewster likes the physical book. They made a BookMobile, with a satellite dish, and it downloads, prints, and bind a book. It costs about 3 dollars per book. He wants to put books back in your hand. There are some other bookmobiles. If we can make this technology work in rural Uganda, they’d have something. They got some funding from World Bank, and it worked! What we found out was that we didn’t have the right books. We have a print-on-demand machine, the Expresso book machine. He’s excited about the $100 laptop. 200 dpi is enough that you can put scanned books in there and they look pretty good. They sent 100,00 books to India with people and scanners. If you care about your books — scan your own. Especially if they’re old or fragile. They picked the price point of 10 cents a page, if it’s the same cost as Xeroxing, you can change the game. If we have mars rovers, you think you could turn pages, but it’s really hard. They now do people-powered page turning and colleges. To do the entire LoC it would be about 750 million dollars, but a million books would be about a 30 million dollars, which isn’t undoable. The Getty is moving their books to UCLA and scanning their out-of-copyright books. They’re looking for funding to get the progress going. They’ve scanned about 200,000, they’re doing about 15,000 books a month. They’re moving from out-of-copyright, to the out-of-print world. He hopes they can meet Amazon in the middle between in-print and out-of-print. Books are within our grasp, we can take it all on without that big a deal. One-time shot and we have the history of printed literature. We can get the whole darn thing. How about Audio? There are about 2-3 million discs published, it costs about 10 dollars a piece to take a disc and put it online. But the rights issues are pretty thorny. Unlimited storage, unlimited bandwidth, forever, for free. The rock and rollers had a tradition of sharing as long as no one made any money. They get 2-3 bands a day signing up, 40-50 concerts a day. Everything the Grateful Dead ever did. 200,000 audio items so far. Moving Images. There’s about 150,000-200,000 theatrical releases ever, about half were Indian! There are only about a thousand that are out of copyright. There are lots of movies that have never seen the light of day. TV is harder. They’re recording 20 channels, 24 hours a day. They only put one week up, the 9/11 week. Television is dreadfully unrecorded and unquotable. TV is in our grasp, $15 per video hour. About 100,000 videos online. Software, only about 50,000 titles available. We’re best known for the WWW. We’ve been archiving the web since 1996, pioneered by Alexa which donates this collection to the Internet Archive. We make a Wayback Machine that shows you websites the way they were. One thing to learn from the Library of Alexandria — burning! They’re now making multiple copies, one at the new Library of Alexandra. A copy in Amsterdam. What’s the role of public vs private goin forward. Is it proprietary. Universal access to all knowledge could be one of our greatest achievements of mankind. 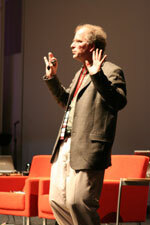 This entry was written by Matt, posted on December 3, 2007 at 9:55 am, filed under Session and tagged Brewster Kahle, eg2007. Bookmark the permalink. Follow any comments here with the RSS feed for this post. Post a comment or leave a trackback: Trackback URL.